Asbestos air monitoring is carried out to assess and ensure the effectiveness of the implemented control measures during the removal and clearance of friable and/or non-friable (bonded) asbestos-containing materials. Air monitoring may be undertaken during an asbestos removal to determine the presence of asbestos fibres outside the removal area or at the conclusion of an asbestos removal, to determine whether the area is safe to reoccupy. Hazmat’s NATA Accredited Asbestos Laboratory provides air monitoring services using our own NATA approved counters and signatories. 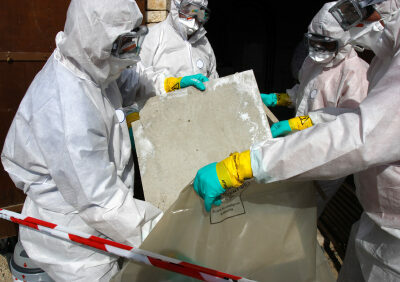 A Hazmat consultant will attend the site to undertake air monitoring and can conduct an asbestos clearance inspection. Samples collected are then analysed to determine the quantity of asbestos fibres in the air. 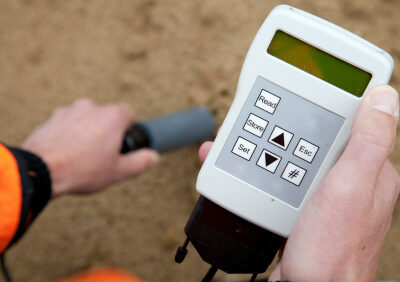 Control Monitoring uses static samples in an area to give a general indication of airborne fibres within that area. Outside asbestos removal and encapsulating areas. At the clean end of asbestos decontamination units. For clearance sampling after asbestos removal and encapsulating. Inside buildings, structures or ships which contain asbestos. Used to determine the general level of fibres in the air at a given time. It is often used in areas where there is known asbestos in-situ that may be subject to degradation. It does not necessarily need to be associated with asbestos removal works but may be undertaken prior to removal or disturbance. This is undertaken during asbestos removal works and is designed to assist in assessing the effectiveness of the controls measures that have been implemented to minimise risk of exposure. Sampling occurs at a a number of strategic locations around the removal works. Depending on the type of project this may include places such as outside the asbestos removal and encapsulating work zone and at the clean-end of the decontamination unit. After asbestos removal works are complete, clearance monitoring is undertaken to confirm that airborne fibre levels are below the required limit. In conjunction with a visual clearance inspection, the clearance monitoring is used to determine that all asbestos has been removed correctly and that the area is now safe to be re-occupied. If you are planning asbestos removal works contact us on (02) 49611887 to discuss your requirements. Asbestos air testing can also be carried out to assess the occupational exposure of workers that may be affected by asbestos fibres at their place of work whilst carrying out there work related tasks. Exposure monitoring involves the taking of regular samples within the ‘breathing zone’ to determine a person’s risk from, or level of exposure to, airborne asbestos fibres. The breathing zone is defined as “… a hemisphere of 300 mm radius extending in front of a person’s face and measured from the midpoint of an imaginary line joining the ears.” – National Occupational Health and Safety Commission Guidance Note [NOHSC:3003(2005)]. This method is intended to be used for the sampling of airborne asbestos fibres in occupational environments where the airborne fibres are known to be predominantly asbestos. Exposure monitoring is undertaken to calculate the level of potential exposure so that it can be compared to the relevant exposure standard. If you are having air monitoring undertaken, make sure the testing is undertaken by a NATA accredited laboratory. Clients, other laboratories, regulatory authorities and the courts can have confidence in the test results. Otherwise, analysis reports may not be accepted by Safe Work NSW, local councils and other authorities. Hazmat is accredited by NATA for asbestos and SMF air monitoring and volume measurement. We comply with the requirements of AS ISO/IEC 17025:2005, legislation that governs the general requirements for the competence of testing and calibration laboratories.